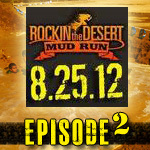 Rockin the Desert Mud Run – Review | Getting Dirty with Laurie and Daniel - A Podcast about Obstacle Racing, Training, and Mud Runs. 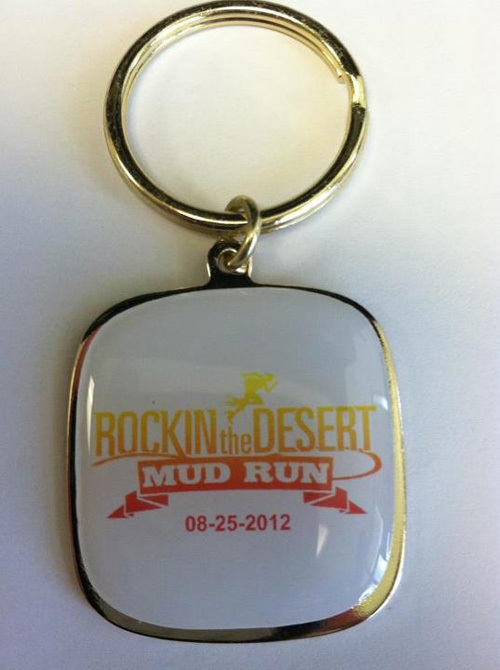 My sixth event of 2012 was this past weekend in Apple Valley, CA for the Rockin the Desert Mud Run. 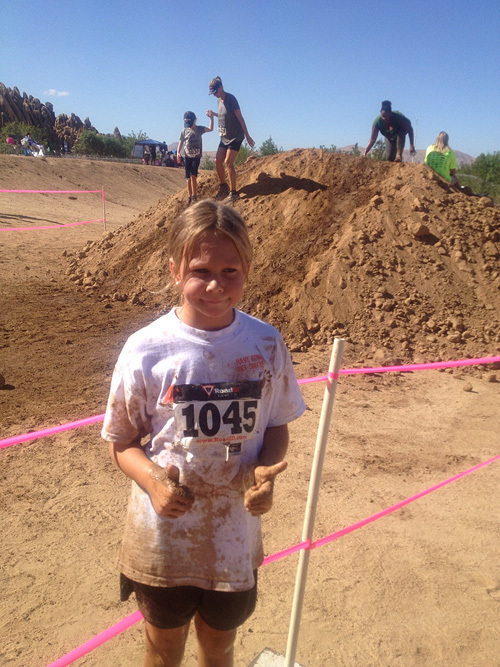 This was a 5K mud run with lots of mud, water and fun. It was a great race for both beginners and seasoned racers. 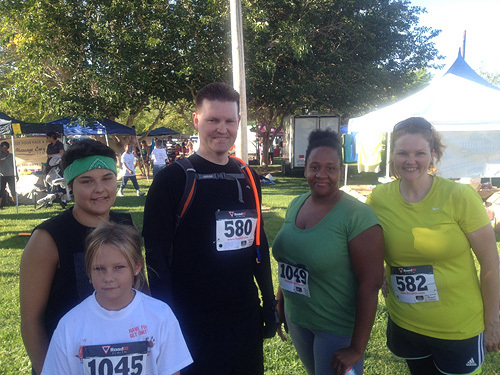 Joining me on this race was my brother Chris, his friend Clarissa, My 16 year-old niece Samantha and my 8 year-old daughter Marlee. My mother-in-law Kathy was nice enough to join us and be part of our cheering section. Marlee was going to run the kids 1 mile race, and the rest of us were setting our eyes on the 5K course. Days leading up to the race I was having second thoughts about signing up. 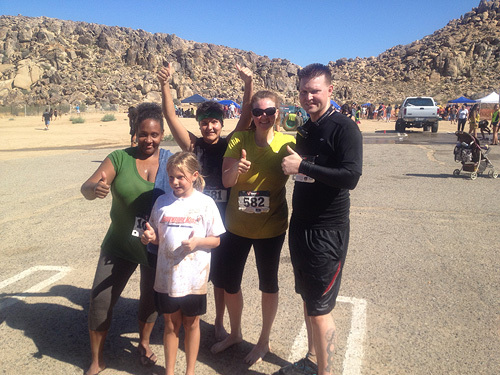 Why did I chose to do an obstacle race in the desert in the middle of August? I MUST be crazy! The heat is not my friend. I really didn’t feel like getting heat stroke while trying to army crawl through mud. 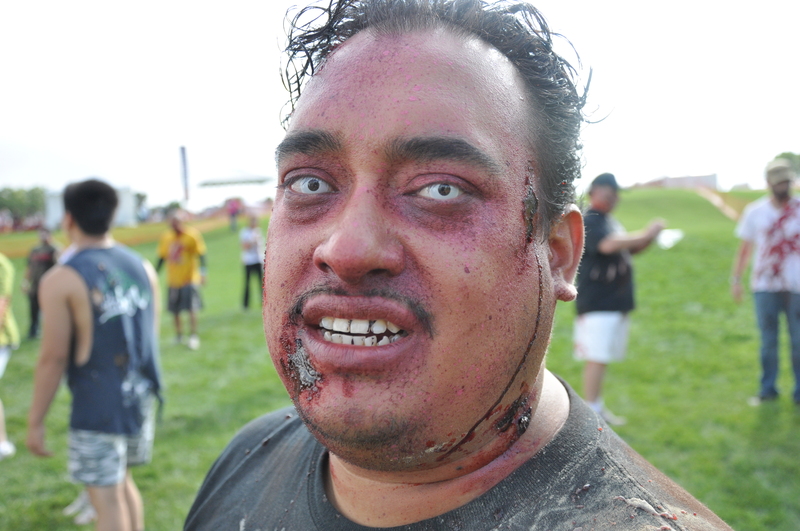 I envisioned myself passing out face down in the mud, and people using me as a stepping stone to get across the mud pit. This is what I was afraid of! Luckily Mother Nature was kind to us and the temperature stayed below 90 degrees. It helped that all the start times were early in the morning before the sun really started to blaze. Overall the event was well organized. The event location was easy to find and and there was lots of free parking. The lines to pick up our race bibs were very short, and we were ready to go in just a matter of minutes. 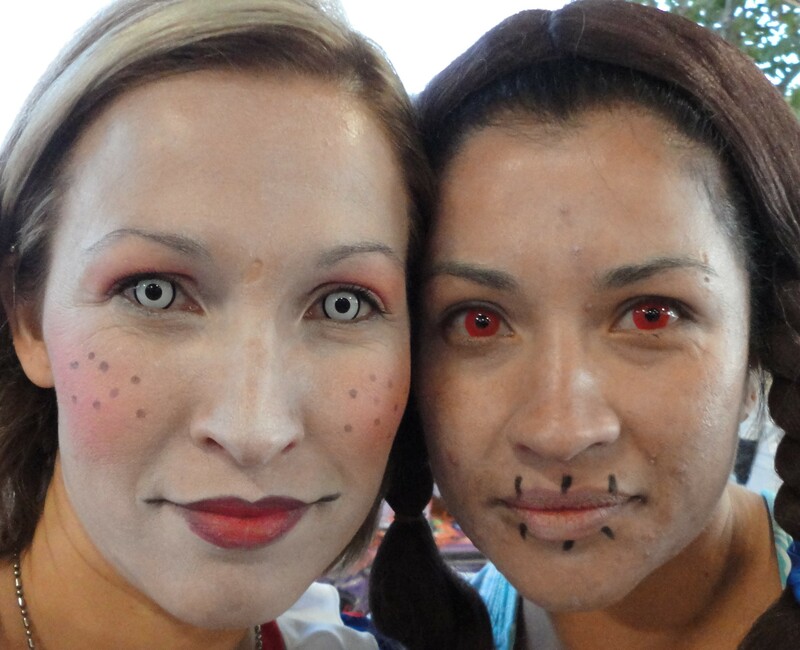 Samantha and Clarissa had never done an obstacle race before, so they were a little apprehensive as what to expect. Chris and I gave them some encouragement and tried to ease their jitters. I was chosen to wear the head cam (Contour Roam HD). The video will come a bit later. Daniel has to edit it and then put it online. This was my first time wearing it, so hopefully the video is of the course and not just the blue skies! 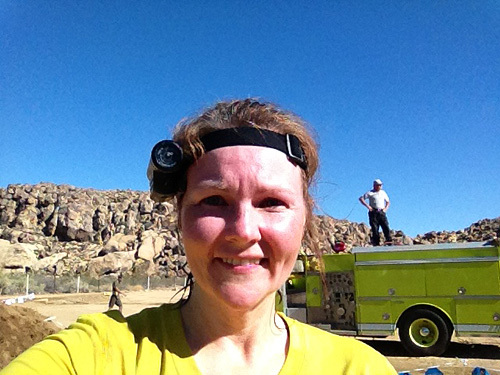 Here I am sporting the Contour Roam HD Headcam. The course was flat for the most part. The obstacles were well spaced with no long distances between them. This race had some favorites like a pipe crawl, trench crawl, water slide, an ice bath and lots of mud hills to climb. They had ample water stations. More than I have seen at other 5K runs. Right past the Start line was the first obstacle. It was two mud hills and two big muddy water pits to run through. They made sure you got nice and wet right at the beginning. The next obstacle was about 100 yards away. This was another water obstacle. It was a short storage metal storage container filled with water. The water went to the middle of my thigh. After that obstacle we went beyond the perimeter of the park and on our way to the open course. It was a short jog to our third obstacle. This was made up of six or eight mud hills that had to be climbed over. It was pretty easy as long as I kept my momentum. 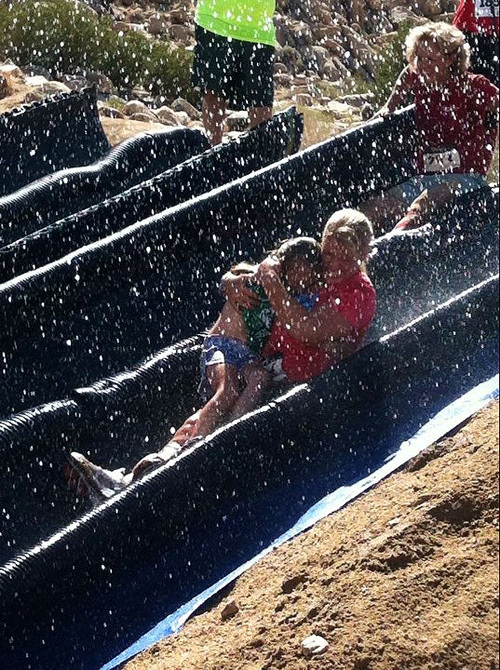 The next obstacle was an old favorite – the tube crawl. This is a muddy water pit with a plastic tube that you crawl through on your hands and knees. To get out of the tube you pull yourself out on your belly into more muddy water. From this point the course made some switchbacks back and forth through a desert field. There were some 4 foot walls that had to be climbed over and more hills with mud pits in between. There was one obstacle calls Mud Hills on Steroids. This was a steep climb to the top of a mud hill with a steep drop into (you guessed it) another mud pit. You could either slide down or run down the hill. I opted for a swift jog down the hill while being sprayed in the face with a fire hose. Yes, There were about four obstacles that included being sprayed by an overzealous volunteer. There was also an over/under obstacle where you are supposed to go under a log and over the next and continue that way until you get to the end. Most people were actually just belly crawling under all of them. There was a water slide obstacle where you got sprayed by another one of these overly excited volunteers into a big pool of dirty water. It was actually pretty fun! One of the obstacles that I was really looking forward to was the ice bath. 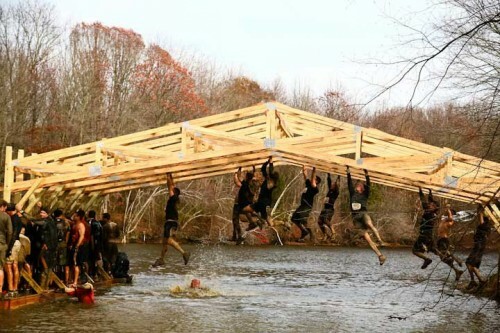 I wanted to know if they were going to go by way of Tough Mudder and have more ice than water in that obstacle. There was only one bin for everyone to go through. This caused a huge back up and I probably wasted a good 10 minutes just waiting to go through the obstacle. There was a metal grate that up to the dumpster that had a rope attached to pull yourself up. (I later realized that the he course mape listed that rope as a separate obstacle). There were about 30 people at one time in the dumpster, which made for the time in there longer than it had to be. The water was cold, probably about 50 degrees. It was definitely no Artic Enema (which is about 34 degrees). There was no ice to be seen, but I’m guessing they filled it the night before and the ice had melted. 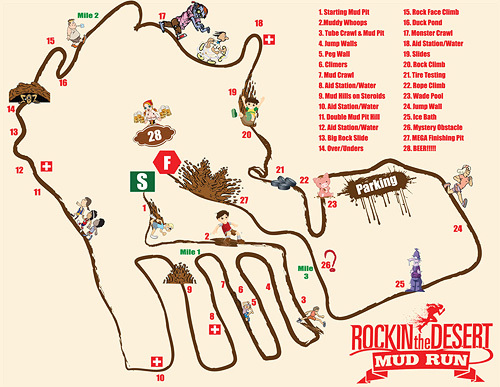 There were a total of about eight different mud hills and mud pits sprinkled throughout the course. Finishers were given a special key ring rather than a medal. I was a little disappointed because I like big bling around my neck after a race. 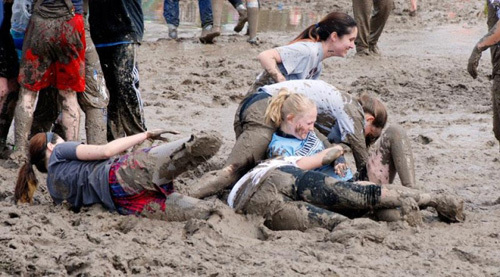 The after party consisted of a Mudfest where you could play mud volleyball and other mud-themed sports. There were lots of food options, local businesses, a good band playing and (of course) a beer garden. If anything could be changed for next year, I would like to see multiple ice baths to decrease the wait time for that obstacle. It would also be nice if there was more variety in the obstacles instead of so many mud hills. But that’s just my preference. 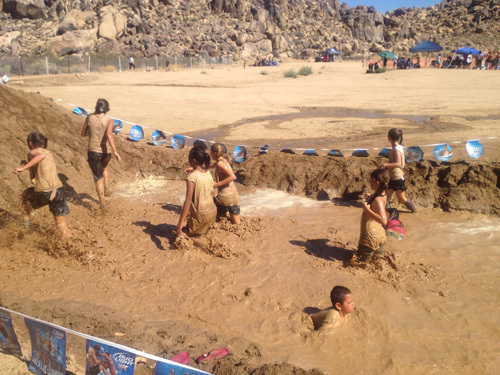 The kids mud run was a mile course that used some of the same obstacles that they adults used. Marlee was right in front when the race started and kept a great pace throughout her run. 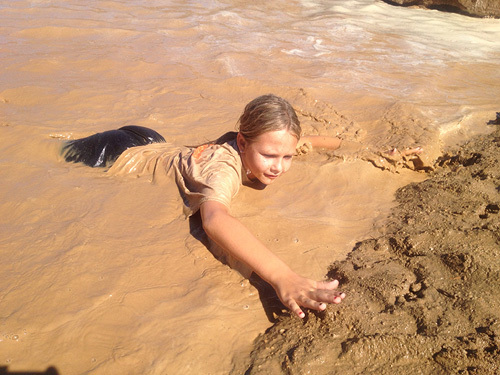 They kids got to experience some of the bigger mud hills, mud pits and one of the water obstacles. Marlee swimming through the muddy water. Marlee ended up with an injury right at the end of the course. She was coming over the last mud hill near the finish line, and the kid above her loosened a large rock that rolled down and hit her on the front of her shin. It looked so painful! I rushed to help her and to see if she was okay. She was such a trooper. We wiped off the blood and she continued climbing up the hill and across the finish line! She’s fine now. It only left a small scrape, but she can show it off with pride. Marlee finishes, but is still dazed by the giant rock that hit her. All in all I would rate this event 8 out of 10. I will definitely keep this event on my radar for next year. We all had a blast and are looking forward to the next year!